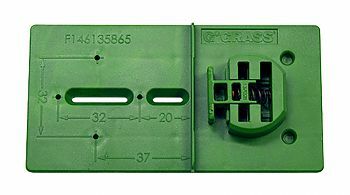 The Tiomos Marking Jig is an easy to use template for Grass Tiomos hinge and base plate installation. The multi-functional marking jig permits easy marking for hinge cup drilling distance of 3-5mm or as a positioning guide for Tiomos straight and wing plate installations. Note: This product is also known as F146135865202 on other websites.